Caption slip reads: "Photographer: Sanders. Date: 1957-05-03. Reporter: Sanders. Assignment: Ramakrishna Monastery. Special instructions: For color negs to Thackrey. 45/46: Modern day Monk meditates scriptures before bronze statue of Swami Vivekananda which stands in the entrance patio of the Ramakrishna Monastery in Trabuco Canyon. 35/36: A student of the order prepares to strike gong as another plays organ in the monastery's temple. 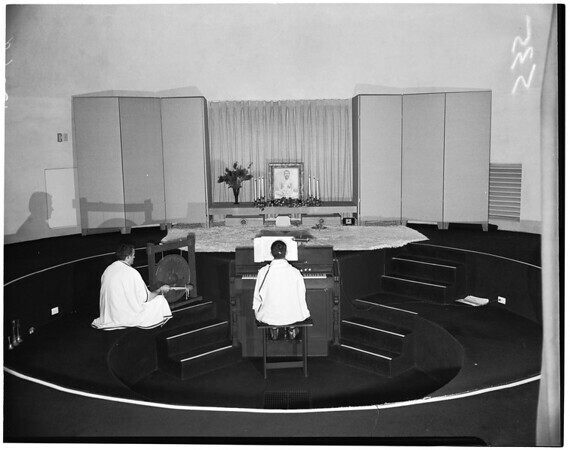 38: Another student meditates before portrait of Ramakrishna, 19th century Bengalese for whom monastery is named. 21: Another prepares the noon meal before the monk's table. 15/16/25/26: Exteriors of grounds. Main building has bell atop. Temple is octagonal with a round dome. To right of temple in No.16 is separate living quarters of six monks and the resident Swami who teaches them".